My one regret about my trip to Israel: not spending more time in what may be the holiest of holy cities, Jerusalem. The city is a mix of the three major monotheistic religions with overwhelming old world charm. Whether you are religious or not, there is undeniably so much history and culture to absorb in the city, and I definitely plan to return for a second helping sometime in my life. Unfortunately for us, the one day we had dedicated to exploring Jerusalem was cold, windy, and rainy (with bouts of hail as well), and we were severely under-dressed for the weather. Therefore my memories mostly consist of shivering, cursing, and trying to remember what my limbs feel like! It may be in the Middle East, but Israel does get cold! However, despite our unfortunate weather, Jerusalem still made a lasting impression on me. All around the city there are markets lined with colorful textiles and jewelry. Of course there are also plenty of kitschy tourist shops along the way, but I really enjoyed just walking these narrow pedestrian streets and feeling like I was in an old world market. I wish I had more time to spend perusing these markets! This one is a bit more personal for me, as you know I converted to Judaism a year and a half ago. As the only remaining piece of the original Jewish temple, the Western Wall represents the holiest site in the Jewish religion. For me, visiting this location was a bit of a pilgrimage. Like the rest of the visitors, I made my way to the appropriate side of the wall (it is separated by gender) and patiently waited my turn to touch the wall and pray. As a skeptic, my expectations were low, but I swear, as soon as I touched that wall I was overcome with tears. Not painful tears, but overwhelmingly cathartic tears. It was a very powerful experience. I can’t say it will be the same for every person, or even every Jew, but for me it was completely revitalizing, like nothing I had ever experienced. For non-believers or non-practicers, I encourage you to visit the wall, but urge you to do it respectfully. The wall is a very interesting place for people watching, especially if you are unfamiliar with Hasidic Jews, but take it easy with the pictures and remember that it isn’t a spectacle, it is a place of prayer. In fact, you shouldn’t take your camera up to the wall, and you absolutely should not take a selfie of you touching the wall. I’m not saying you shouldn’t take pictures at all (clearly I did), but respect the believers when you do so. I was surprised by how much I enjoyed visiting the Church of the Holy Speulchre. The church is located at the site of Jesus’ crucifixion and is shared between 5 Christian denominations (6 if you include the Ethiopian sect that is right outside the church). The church itself is dark and dingy, probably from thousands of years of candle soot, but I think that added to the mysticism of the place. Within the church you see precious relics such as the stone on which Jesus’ burial preparation took place and the hole which is thought to be the location of his cross. I recommend visiting with a guide so you understand the significance of all of the items in this decorative and revered church. Bring a raincoat. I would have been far less miserable if I had only prepared for wet conditions. I’m not sure how often it rains there, but I think this is good travel advice wherever you are visiting. Spend at least 2 days in the city of Jerusalem. There is simply too much to see in a day. You could and should spend an entire day just getting lost in the markets. Tour the Muslim quarter. Going back I would definitely want to have a closer look inside the Muslim quarter and Temple Mount area. Celebrate a Sabbath meal with a local. We looked into opportunities to do this through Shabbat of a Lifetime, but ultimately chose not to. That’s my second regret. And so this concludes my series on the Holy Land of Israel. Be sure to check out my other guides on Tel Aviv, The Dead Sea, The Golan Heights, and The Negev Desert. 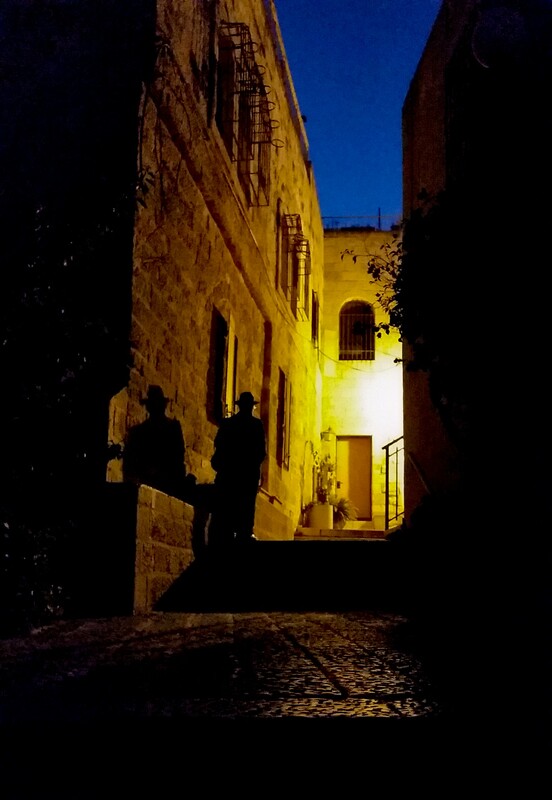 I leave you now with just one photo that captures Jerusalem and Israel perfectly – the silhouette of a Jewish man standing in the narrow streets of Jerusalem. My favorite picture from the entire trip. Tell me what you think. Have you ever been to Jerusalem before? I love to hear your comments!